When she was 11 years old Jeanne lived abroad in Spain with her parents where she rode Andalusians. When she came home, she was very active in 4-H from a young rider to adult leader and instructor and horseshow judge. As an adult she was employed in her “dream job” as foaling manager for the successful racing Holly Crest Stables. She became an expert in foaling and foal and broodmare care. Her whole life has evolved around horses and her Sunset Meadow Farm operation is the culmination of a great career in the horse industry and living the horse life. Jeanne Yuyosecvich and her husband Ken Kehoe of Sunset Meadow Farm in Farmingdale, N.J.
Jeanne Yuyosecvich is the embodiment of the “Spirit of the Horse”. She has re-homed many ex-race horses on her own and has established organizations such has Re-Run using her ability of networking to find these hard working horses their forever homes where they can enjoy a more natural “Horse Lifestyle”. The 2017 winner of the Gold Medal Horse Farm award is Hidden Hills Farm, owned and operated by the Nienart Family. Hidden Hills Farm, located in Hillsborough Township, New Jersey, is situated on 40 acres of grassy land. The facility boasts a large outdoor (and attached indoor) arena, as well as an ample turnout. The Nienarts have made a commitment to conservation and worked with the Natural Resource Conservation Service (NRCS) for planning, technical assistance, and grants to make their idea a reality and developed a comprehensive nutrition management plan, developed a soil erosion / water reclamation plan, and use “rotational grazing” to make sure that their farm is not only aesthetically pleasing, but an example of environmental sustainability and management. 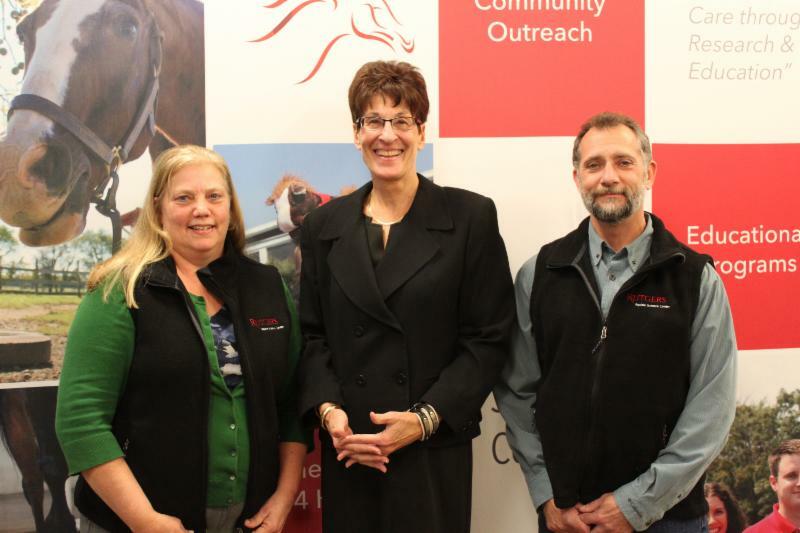 The Nienarts, owners of Hidden Hills Farm in Hillsborough Township, N.J., pose with Dr. Karyn Malinowski after receiving their “Rutgers Equine Science Center” vests. 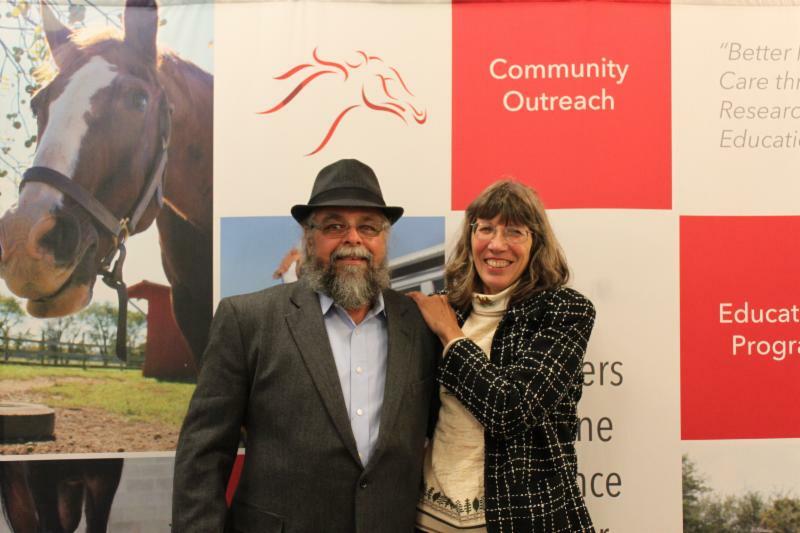 The award and overall program gives recognition to outstanding equine farms for their dedication to environmental sustainability and management. It also underscores the efforts of the New Jersey equine industry to maintain the beauty of the Garden State. The program is a collaborative initiative by the New Jersey Agricultural Experiment Station at Rutgers University (NJAES), the Rutgers Equine Science Center, and the New Jersey Department of Agriculture (NJDA). Both recipients received their awards at the recent “Evening of Science & Celebration” held by the Equine Science Center on November 17, 2016. The Evening of Science & Celebration is an opportunity to unite equine professionals, horse owners, farm owners and barn managers, educators and students, 4-H members, and all equine enthusiasts for the purpose of learning about current projects and ongoing research initiatives being conducted at the Equine Science Center.